When we first did the conversion on the Good News Bus we ordered a used Carrier A/C unit from ebay. If I remember right we paid around $350 for it. Yesterday we woke up to a warm bus. At first I thought maybe the unit had just froze up in the night but after some trouble shooting and smelling a slight burning smell we came to the conclusion that our old unit had died. It probably got more use in the last 6 years then most RV A/C units get in a lifetime. The bus quickly became hot. 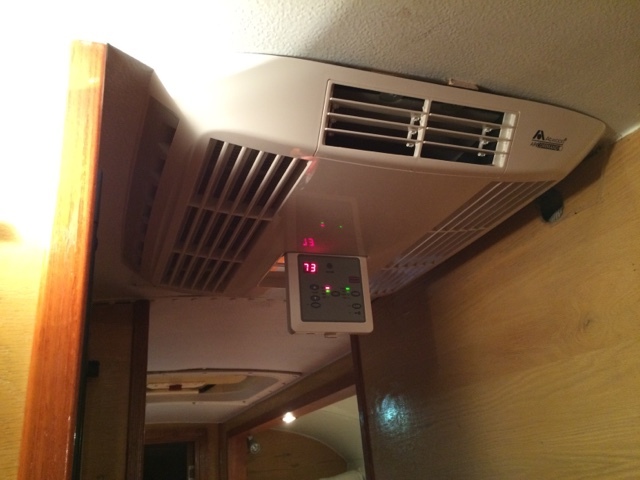 The heat index yesterday for our location was 108 F.
We did some calling and found the Atwood Air Command A/C unit at a Carpenter's Campers located in Pensacola, Florida. Larry Overman, the parts manager, was very helpful. Installing it was a bit tricky, not because of the unit itself but because of the location where the unit goes. We had to modify the install bracket so that it offsets the roof unit by 2". We did all this in probably 120 F.
After installing it we kicked it on and the bus cooled off very quickly. So far we are very happy with the unit. It keeps the entire bus nice and cool even in the Florida heat! Air Command is the QUIETEST, MOST EFFICIENT air conditioner in its class, with 18K BTU equivalent performance... THE LATEST TECHNOLOGY using the LEAST AMOUNT OF ENERGY. Air Command was designed, tested, and proven in the Australian "Outback" to withstand rigors of the harshest elements. This model features 18K BTU equivalent* performance, superior V-FLOW™ air distribution, a digital thermostat with remote control, and an independent dual motor design... even heat pumps come standard in 18K models! Air Command's durability, function, and features are unlike anything else on the market today. will you be posting video footage of this install? We hope so. 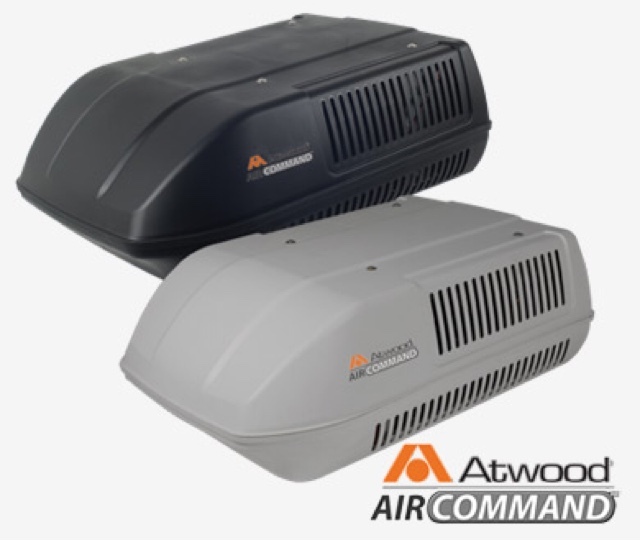 How does the cost of your new Atwood Air Command compare to your used eBay unit? We did film it and hope to have it in an upcoming video. The Atwood new and complete is around $800. It is far superior to our last one. Thank you! 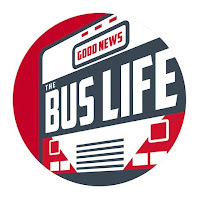 My wife and I have looked at RV"s and converted buses but prices tend to be high. Your posts and videos are inspiring us to consider doing our own conversion. What is the model number of your unit? Is it ducted or non-ducted, and what does that mean? Thanks for telling us about it. I'd like to get the same for my AmTran too. I just added the model number to the post title. If you get the ducted unit you would have to run ducting throughout your bus. The unit we have you can just install and your ready to go. We are in Florida and it is doing a great job. We had to do a little customization to accommodate the curve of the roof. A lot of reviews that I have read say that this unit is much quieter than most.. Do you agree?? It is WAY quieter then our previous one! Absolutely the Airwood air conditioner is awesome. I already installed it on my RV van. It works perfectly.